During International Data Week 2016, the Office of Scholarly Communication is celebrating with a series of blog posts about data. The first post was a summary of an event we held in July. This post looks at the challenges associated with financially supporting RDM training. There is a desperate need for training in research data management. Our significant engagement with researchers at the University of Cambridge over the past 18 months has indicated to us that research data cannot be effectively shared if it has not been properly managed during the research lifecycle. Researchers cannot be expected to share their data at the end of their research project if they are unable to locate their data, if the data is not correctly labelled or if it lacks metadata to make the data re-usable. We have stated that on several occasions, including our response to the draft UK Concordat on Open Research Data which was released in its final form on the 28th July this year. To test whether our beliefs were in-line with researchers’ needs, last year we conducted a short survey on research data management needs among our academic community. 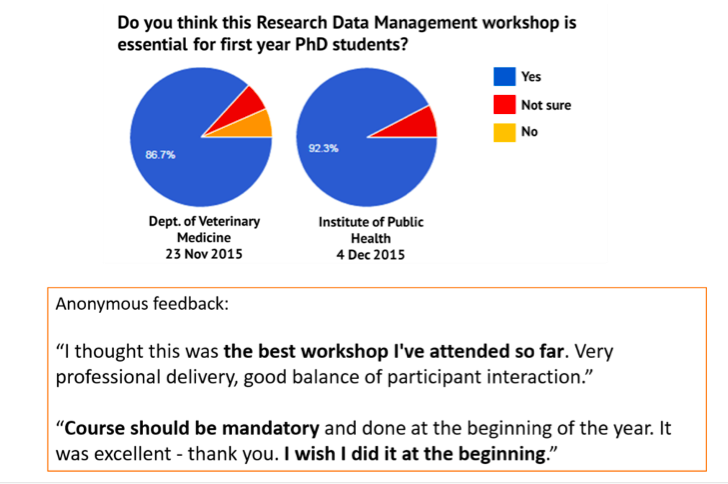 Of those responding, 94% of researchers indicated that it would be ‘useful’ or ‘very useful’ to have workshops on research data management (see our earlier blog post for the full discussion of the survey results). In response to this we developed a 1.5 hour introductory workshop to research data management and started delivering this to researchers in Cambridge in July 2015. Our workshops have evolved substantially since the initial sessions, through responses to the feedback we collect. The workshops are now considerably improved, not only more interactive, but also have been extended to 2.5 hours to allow time to provide more practical examples of good data management. The feedback from our workshops was overwhelmingly positive. 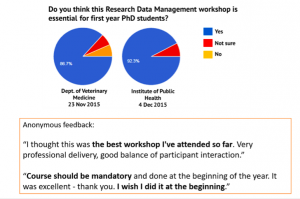 As a result, many departments identified research data management skills as core competencies needed by every PhD student and asked us to deliver our workshops as part of their compulsory training for PhD students. This is fantastic news for both our team and the awareness of RDM at Cambridge, and we have therefore accepted all these individual requests. But sometimes you can be a little too successful. We recently received another request from the Graduate School of Life Sciences to make our workshop compulsory for all their PhD students. While this is great news, there are 400 new PhD students every year at the Graduate School of Life Sciences. The maximum capacity at our workshop is 20 attendees, which means we would need to deliver 20 workshops throughout the year to cover this cohort. And when we consider the Graduate School of Life Sciences is one of five schools accepting PhD students in Cambridge, we need to look at how we would respond if other schools approached us with similar requests. Another issue is that while our improved workshop on research data management covered the basic research data management needs, researchers have told us they need more in-depth discipline-specific training. We recognise this, and do try to provide training that is directed at the audience – a challenge when we need to serve all researchers across the University – from arts and humanities through social and life sciences, to medical research and particle physics (and many, many other disciplines). So we have identified a broad need for RDM training, a specific need for training for PhD students as they begin their research, as well as discipline-specific support for all researchers. But there are only two staff members in the Research Data Team who can deliver RDM training, and delivering training is only one of many tasks which we need to undertake for the Research Data Facility to function. We simply do not have the capacity to meet this obvious need. After discussion we have agreed to deliver four workshops out of the requested 20 for the Graduate School of Life Sciences and to reconsider the situation in the summer break next year. We have begun to think both about how we can meet RDM training needs given current staff capacity and how we can link the experts in different aspects of data management that we know exist around the University of Cambridge. There is already an active OpenCon Cambridge group which promotes the benefits of Open Access, Open Data and Open Education; but we wanted to focus on all aspects of RDM. We have started to develop the idea of having Data Champions in each department, institute or college who can act as the local experts as well as delivering some discipline-specific training to their community. This has the advantage of increasing the number of trainers across the University, making the workshops tailored to the relevant audience, and building a community of experts. The University of Cambridge is not alone in facing this problem and the several other universities are pursing, or already have, Data Champions in some form. The idea was recently discussed on both Jisc RDM mailing lists and at the Research Data Network meeting which was held at Corpus Christi College, Cambridge last week. At this meeting several different models were proposed, including a national network of champions who could advocate within disciplines at a senior level. Whilst a national network of champions would be great in the long term we still have an immediate problem within the University of Cambridge and so we have launched a Call for Data Champions to help us raise awareness and increase the amount of training available. The call is open until 17th October and we would welcome any research or support staff or research student with an interest in RDM. There will be support available in learning how to deliver RDM training, a template workshop provided, the opportunity to influence the future of RDM services and a website built to showcase our Data Champions. We hope to bring all the Data Champions together towards the end of the Michaelmas term so they can start delivering workshops in 2017. We hope to foster a community of experts who can share their knowledge with each other and the Research Data Team so we are in a better position to support our researchers. The community of Data Champions we hope to bring together at Cambridge will begin to ameliorate some of the problems we are facing with regards to RDM training. However, we will still struggle with staff capacity and at some point researchers will need to be appropriately rewarded for sharing data and supporting others to do the same, a theme of our recent Open Research discussion event. So we have a temporary solution, and one which we hope will significantly improve the RDM training available at Cambridge, but the issue will not be solved until the underlying incentives for sharing data, publications and all the other research outputs have been addressed. Something has been rumbling under the surface in the repository world recently, at least in the UK. Over the past six months or so, the Office of Scholarly Communication has had some fraught conversations with researchers who are terrified that their papers will be ‘pulled’ from publication by the journal. The reason is because some information about the upcoming paper is publicly available. The HEFCE policy asks us to deposit the Author’s Accepted Manuscript into a repository “as soon after the point of acceptance as possible” and to present the manuscript “in a way that allows it to be discovered by readers and by automated tools such as search engine”. So when a researcher deposits a paper we check the publisher copyright restrictions and deposit the work into the repository – shutting down the article, but making the record public. What this means is that the metadata about an article is publicly available before it is published. Similarly, researchers also share their research data in the repository and make the metadata publicly available. Funders and universities require researchers to include a statement in their publications about the availability of research data supporting their findings. What this means in practice is that researchers deposit research data supporting their manuscripts into data repositories before the corresponding manuscripts are published and more and more frequently, even before these are accepted (to ensure that peer reviewers have access to all supporting materials). Before I go into detail about our challenge, let’s get a few terms straight here. When we talk about ‘data’ in this space we mean the information generated during a research project from which observations and conclusions are made in academic papers. The ‘metadata’ is the information about that data. In the case of an article, the metadata includes the authors, the title, the journal and the abstract. The metadata for datasets is less well defined, although there are data citation principles, so metadata in this case is information about what the data is, how it was generated, how to access and interpret it. The second term that matters here is ’embargo’ – the word of the moment for me, given my recent participation in the Open Scholarship Initiative Embargo Workgroup. Our resolution was that we need to fund a research piece to resolve the reasoning behind embargoes (bearing in mind there is no link between half life of article usage and subscription rates) and what is a reasonable period of time for them. Some publishers impose publication embargoes on the release of the Author’s Accepted Manuscript for a period of time after publication. The business of managing embargoes falls into the laps of repository managers. Indeed I have written before about how the complexity of different publisher agreements means it is almost impossible for an individual researcher to navigate the rules. We manage embargoes by putting the article under indefinite embargo when we deposit it and then check back on a rotational basis to see if the work has been published. Once it has, we can set the embargo date. And this is time consuming – to give an idea of scale we currently have over 1700 papers in the ‘checking’ pile. There is a second type of embargo – a press embargo. This is an embargo which prohibits anyone actively discussing the content of accepted papers with the media prior to publication. The exception is that a few days before publication the journal allows journalists access to the published papers so they can prepare news stories to coincide with the publication of the work. It is this second type of embargo that is causing confusion with the research community. Our researchers are concerned that having the metadata about an article available means that publishers will consider this a breach of embargo and will pull the publication. Note that the Author’s Accepted Manuscript of the article itself (or the data files, in case of datasets) is locked down and the information about the volume, issue and pages are missing as the work is not yet published. The researchers are worried because there is a need for publication in high profile journals such as Nature for their careers and if a work was to be pulled from publication this would have huge implications for them. This has caused a challenge for us – clearly we do not wish to threaten our researchers’ publication prospects, but we are also bound by the requirements of the HEFCE policy. In November last year I put a query out on a couple of mail lists about this which generated a great deal of discussion. As it happens some UK repository managers are locking down the metadata about ALL articles until publication. So we have decided to go to the source and are now in discussion with various publishers. A few things have come to light. First, generally publishers understand the distinction between these embargoes (details about responses are below). However there appears to be confusion at the editor level about this – and our researchers are in contact with editors. The second issue is the level of bullying that researchers appear to be subjected to by the publishing industry. They are petrified of doing the ‘wrong thing’, and that they will be punished by having their article pulled. There is of course a question about whether any articles ever have actually been pulled because of metadata being available prior to publication or if this is yet another ghost we are boxing. No researchers to date have given us a concrete example of this happening. Below is some of the correspondence we have had with publishers to date on this issue. The responses have been varied – from helpful and encouraging to restrictive and uninformative. Late last year I contacted Nature Publishing Group (NPG) to ask their position on this issue and they were adamant that they do not pull papers from publication if the metadata is available prior to publication. They did: “ask that our two embargoes – self-archiving embargo and press embargo – are respected”. They clarified that “NPG deposition to all PMC repositories allows the deposits to be fully discoverable as soon as processed by the repository, and the manuscripts’ full text become accessible 6 months after publication. In practice, this also means metadata can be available upon acceptance“. Remember that this is the publisher telling us to suppress the metadata about data that is published by us in our repository. The big problem we have (apart from the principle of this issue) is that while we can automate the turning off of an embargo in the repository we cannot automate the movement of an item from a dark archive to an open one – this must be done manually. The paper was published on Good Friday. There was no-one physically at work (indeed the Library was closed) until the following Tuesday. So for the first four days of this article being in the public domain there was a dead link to data in it. This is not just ‘non-ideal’ – it is contrary to the idea of effective and complete publication. An example of the problem we are encountering happened only last week. We were contacted by a researcher who demanded we take down the details of their accepted paper that was to be published in The Lancet because an assistant editor had taken issue with us posting the metadata prior to publication. Again we contacted the publisher and asked them their position. When we spoke to The Lancet they were helpful and positive, reassuring us they were “happy to permit the release of article metadata at this stage”. They also said they had been in contact with the assistant editor of this article who has directly contacted the researcher. The explanation was “it looks like there was a misunderstanding regarding the wording of one of our policies”. Our correspondence with Elsevier was particularly unhelpful. While acknowledging that press embargoes are “editorial policy rather than open access policy” and that they are designed to create press interest, they concluded that this “isn’t a matter for a corporate policy at company level”. “You’ll notice that our policy is that we discourage release of the metadata and abstract prior to official publication. The reason is that this would be considered breaking any press embargoes on the article. So while, like Nature, we would not prohibit release of metadata, it means that it would be unlikely that the article would be considered for a press release. If you think that your article is likely to be appropriate for a press release to top-tier media outlets, then we recommend delaying deposit to the institutional repository until the article is officially published. There are two problems here. There is the practical embargo issue repository managers face, and there is the bullying of researchers problem. In the case with The Lancet, despite us explaining that this was a considerably larger problem for us than this particular example, the researcher was unwilling to give us any further details as to the communication they had received from the journal other than it had been an ‘assistant editor’. This ‘protection’ of journals by researchers is not uncommon in our experience. indeed, a recent article noted the “oppression” by editors stating for example that researchers are “afraid to say anything about the New England Journal because they’re afraid they won’t get something published there”. Bear in mind that Nature specifically stated that they were unaware of any examples of a paper being pulled because the metadata was available prior to publication. We have not been able to uncover a single concrete example of this actually occurring. Yet we continue to have distressed and frightened researchers contacting us because of this threat. I don’t have an answer to this bullying problem other than our need to move away from having publication in a high impact journal as the be-all and end-all for research careers. In case you are in any doubt of how destructive this situation is, consider ‘Your Right Arm for a Publication in AER?‘ where researchers indicated they would be prepared to lose half a thumb for a high profile publication. But reconfiguring the reward and recognition processes in research is a long way off. Meanwhile the least we can do is acknowledge this is happening and bring it into the open. In relation to the embargo issue, while we can continue to contact each publisher in turn and try and negotiate these issues with them, this is hardly time efficient given it is a sector-wide problem. The ‘solution’ from some (well resourced and staffed) publishers is that it is up to individual repository managers to contact each journal in turn for clarification. This is clearly not possible given that our staff time is already spent checking and complying with the myriad of different publisher requirements in place. A different solution could be that publishers shorten the time between acceptance and publication. When journals have a quick turnover time, the period when an article’s metadata is publicly available before publication is limited to a matter of days. It is different when there is a delay of months or even years between acceptance and publication. I should note that our team debated about whether writing this piece would actually do more harm than good – triggering publishers to suddenly introduce further restrictions on metadata. Managing repositories and juggling embargoes and funder policies is already complicated enough. Material available in institutional repositories is only a small percentage of material that is publicly available – according to the Monitoring the Transition to Open Access report, institutional repositories in the UK hold 7.9% of Author Accepted Manuscripts, compared to 56.6% in subject repositories and 19.7% in social sharing sites. Yet we are generally the ones actually adhering to the complex sets of embargo rules. We consider this to be a sector problem – and one that should be addressed by sector-wide resources, such as the funding bodies. I should note Jisc have expressed interest in supporting us with this issue. The increased crack-down on our activities is frustrating, unhelpful and feeds the beast that is the publishing industry stranglehold on researcher behaviour. The Jisc Shared Research Data Management Service pilot will allow institutions to work collaboratively with the aim of producing a system that is greater than the sum of their parts. Sarah Middle started work as Institutional Repository Manager at the University of Cambridge’s Office of Scholarly Communication in November last year, and discusses her involvement in the pilot here. As well as having the potential to provide a better quality system, the shared RDM service is likely to increase efficiency and reduce costs – rather than replicating the same smaller models everywhere, there will be one central hub. It should also provide solutions to particular issues faced by individual institutions, which they do not currently have the expertise or resources to solve themselves. Particular issues we have faced with our current setup at Cambridge include data management, curation and preservation of big data and sensitive data, and we welcome the potential facility to solve these issues that this project is intending to provide. Having a shared service in place should pave the way for collaborative efforts to commission and produce new features and resources to benefit the whole academic community. Institutions will be able to pool their resources and initiate far more ambitious and important projects than is possible on a single departmental budget. Working together will enable us to approach major suppliers as a group, which should give us more leverage in negotiation and ensure that funds are used wisely. In terms of discoverability, a shared service will increase the visibility of individual institutional data collections by enabling cross-institutional searching from a single platform. Institutions will be able to commit more of their time and resources to enhancing metadata than developing and maintaining systems, which should improve the quality of description. Additionally, a shared service could provide the foundations for introducing a minimum metadata standard for datasets, which would provide some standardisation across institutions, potentially enabling better linking between datasets. At Cambridge, we are particularly excited to be involved in this pilot, as we believe that collaborating with other institutions in this way is key to the long-term sustainability of research data management services, and we are keen to help shape these plans from the outset. I am excited to be involved in this new project to bring together data, standards and best practice from different institutions. As well as the potential benefits for research data management at Cambridge, I hope that on a more personal level, this project will allow me to meet with and learn from colleagues in similar roles throughout the UK.